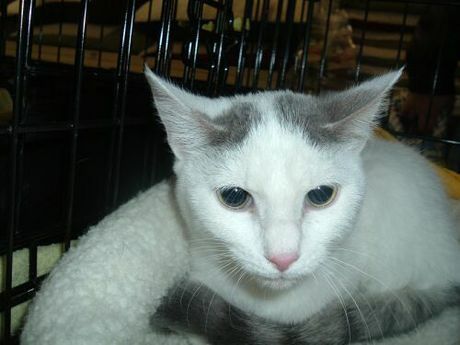 Paris is available for adoption through Love-A-Stray Shelter. CatTime is thrilled to support Love-A-Stray Shelter, recipient of a DogTime Media donation as chosen by Petties winner Jaime Smith (Best Product Review Blog). Love-A-Stray is a non-profit, all volunteer, no-kill organization dedicated to helping homeless animals. Our mission is to end the pet overpopulation problem through aggressive low-cost spay/neuter programs, support and implementation of TNR (trap/neuter/return) programs for feral cats, aggressive and innovative adoption programs and education of the public on the importance of spay/neuter. We support our cause through adoption fees, fundraising, and donations. All funds directly benefit the animals. Through direct calls, requests through our website, word of mouth, individuals stopping at out shelter. All animals upon arrival if healthy receive their vaccinations, wormer, flea treatment, bathing if necessary, and are scheduled for spay or neuter. Animals in distress are transported immediately to one of our veterinarians for care. In May of 2012 some individuals from a local steel mill came to the door. With them they had a beautiful young female orange tabby. She was obviously in need of immediate care. The story is that while the worker’s at the mill were doing a routine check of a vacant building, they heard a cat crying. Upon further investigation they found her hanging upside down by her back leg hock area from a giant fan in a furnace. The men could not get her free and had to get a SawZAll and cut her out of the fan by cutting the fan blades to free her. Our local clinic that we work with, determined she had been hanging there for some time. They were able to debride the dead tissue from one hock and suture it closed. On the other leg, the calcanian tendon was cut and had to be surgically fished down and re-threaded through a hole drilled in the hock and then casted for 6 weeks. After a week at the vet’s she came back to us for cage rest and care during the healing process. She was a sweet, wonderful girl. We named her “Elsa” and 8 weeks later she was adopted by a wonderful family! We have many stories like this – many with happy endings, others with not as happy an ending – but at least they did not die, alone, hungry, cold or hot or not knowing care and love. Inspired by the work of Love-A-Stray? Consider making a donation to their organization.